This Saturday night live on HBO, Miguel Cotto takes a final bow at his home away from home, Madison Square Garden, in New York City. The Puerto Rican faithful will get a chance to see their legend one last time. 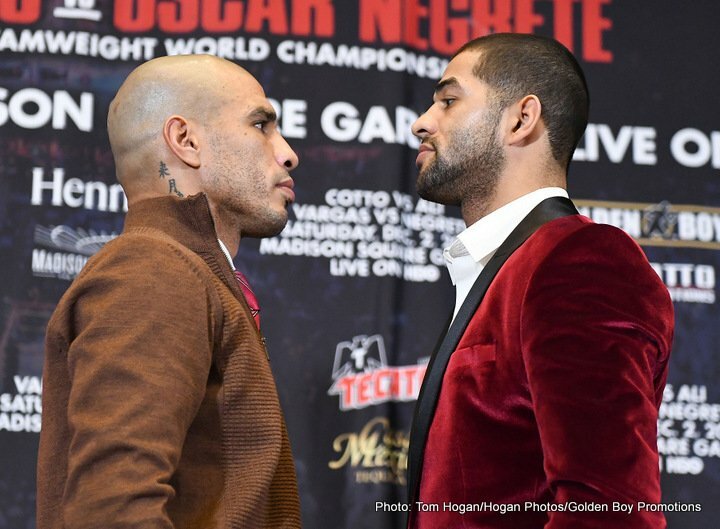 His opponent, an odd choice in Sadam Ali, should be just what the doctor ordered for Cotto to walk away in the sunset. Beyond a few of the early rounds when Ali’s speed and movement could be effective, this should be a fairly easy victory for Miguel. To be fair Golden Boy Promotions attempted to secure a tougher task but failed when they attached future options on Mikey Garcia and Errol Spence. Jessie Vargas claimed the money wasn’t right it’s also rumored Danny Garcia refused the offer as well. And since we’re being fair, it’s fair to say they could have tried someone in the deep and talented junior middleweight. Most fans aren’t that excited about Saturday’s HBO main event especially because Cotto just had a send-off opponent in August. But, that’s boxing and if HBO wants to waste money it is what it is. Let’s focus the rest of this short piece on the legendary Miguel Cotto. I realized after doing a long segment Wednesday on the Rope A Dope Radio Podcast and while finishing up this piece, just how much I will miss Miguel Angel Cotto. Cotto was known for his powerful left hook to the body and the ability to seek and destroy early on. He started his path to greatness at junior welterweight. At some point that weight class began to sap his strength and energy. Miguel’s jab is a thing of beauty, as he moved up in weight the rest of skills began to flourish. In a back and forth paced-scrap with Shane Mosley, Cotto wisely chose movement in the last few frames. Cotto went from being the hunter at 140 to the smoother, all-around skillful pugilist at 147 and beyond. The cool thing nowadays on social media is to rip Cotto for being a diva. While I understand being critical of any fighter for numerous reasons, everything has to be added to a pot and stirred up. Instead of choosing to judge Cotto from the last couple of years one should remember to put it everything in perspective. Yes, he was never going to fight Gennady Golovkin in 2015 but it’s not like taking more money to challenge Canelo is a cherry pick. Yep he did call for a 153-pound catchweight in the negotiations for Canelo. So what, Canelo was the catchweight king at 155. It’s okay to be frustrated or even to boycott this event. Bottom line the blood he spilt over a career makes up for anything diva-like. In fact the punishment Cotto took July 2008 in a full-out war versus Antonio Margarito was more than enough to make up for some diva drama. If we’re being honest the vast majority of star boxers at some point show diva tendencies. Cotto never cheated the fans or himself and for that he will always be respected to the highest. This man brought his full heart and soul in the ring and left everything he had in it. That summer night in Las Vegas (2008 Margarito) a part of Cotto’s fighter spirit was taken. He will never be the same and he’s okay with it. Instead of focusing on the small things in the later stages of a hall of fame career we should appreciate what Miguel sacrificed. God bless you Miguel Angel Cotto. By the way my Official Prediction is Miguel Cotto by mid to late stoppage. Side Note: If Canelo Alvarez loses in the potential rematch to Gennady Golovkin don’t be shocked to see Cotto return.